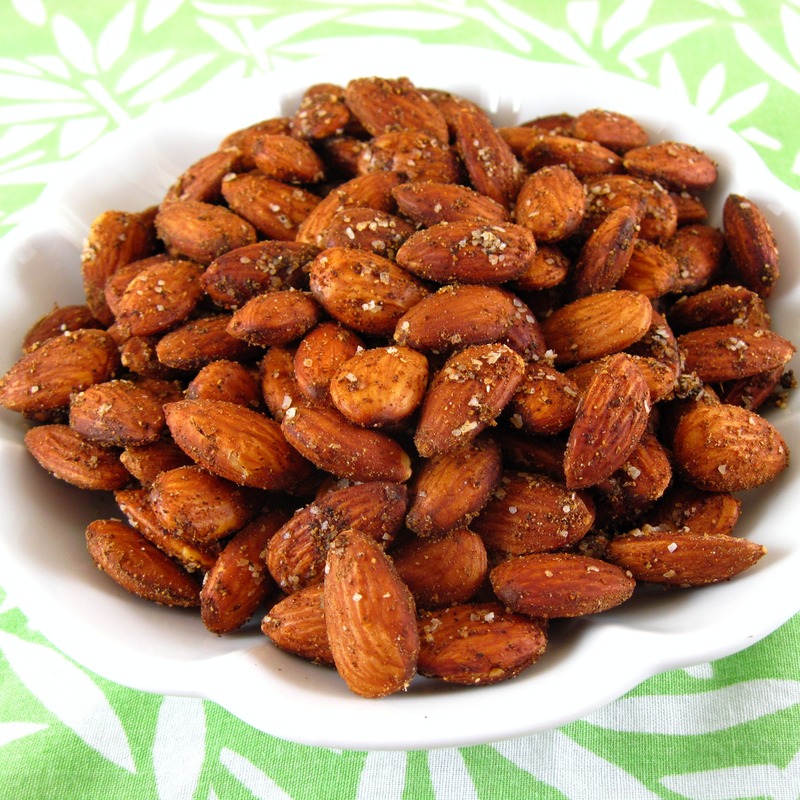 Vij’s Spiced, Roasted Almonds make a great snack or appetizer with drinks. The spice blend makes them irresistible. The recipe is another winner from Vikram Vij’s and Meeru Dhalwala’s Vij’s: Elegant and Inspired Indian Cuisine. 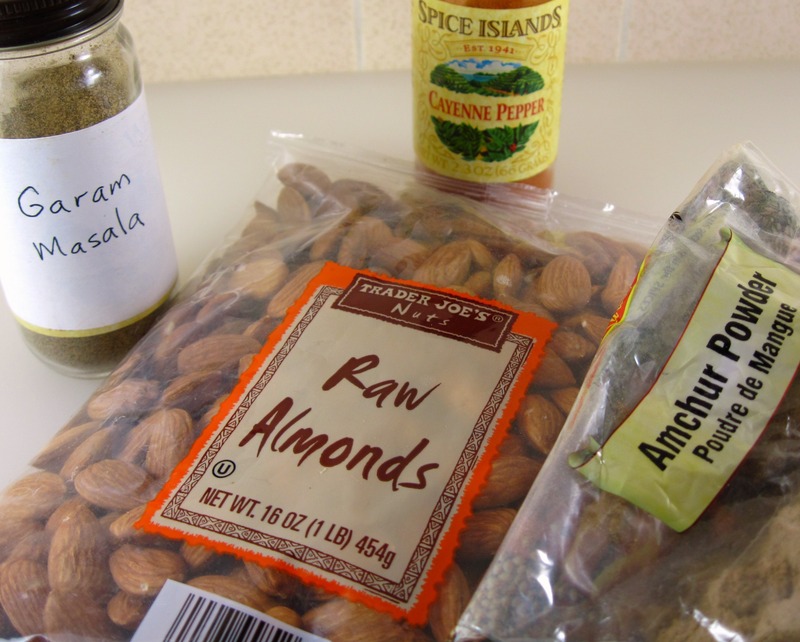 The recipe suggests using almonds or cashews; I chose to use almonds. You can substitute ground cumin for the garam masala. It will still be good, but it will have a different flavor. I don’t know of a substitute for the mango powder (amchur). Mango powder is used to give a bit of a sour, fruity flavor without giving moisture to Indian dishes. It can be found at Indian groceries. I ordered mine online from indianblend.com. I think it’s worth seeking out, but you could omit it, if you must. Once you have the ingredients, the recipe is very quick and easy. It takes about 15 minutes to make it. Edit 8/29/12: Bob, who actually does like things quite hot, thought the almonds were too spicy with 1½ teaspoons cayenne. They were pretty hot. I just made them again with ½ teaspoon cayenne and I think they are better with less heat. I have made this with almonds and with cashews. They’re both great, but I think I prefer the cashews. 2. Combine the salt, mango powder, garam masala, and cayenne pepper in a small bowl. 3. If using coconut oil, heat it briefly in the microwave or on the stovetop until it is liquefied. 4. 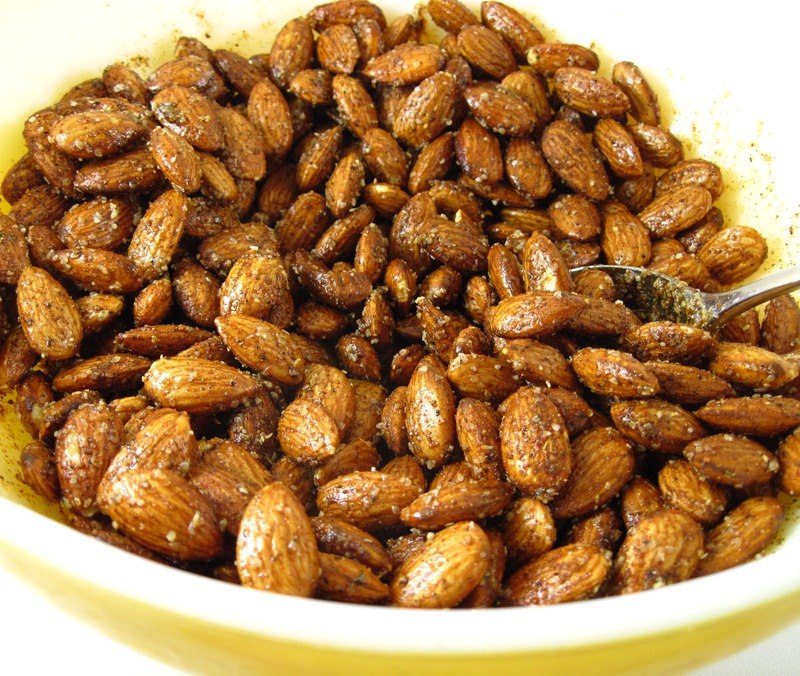 Toss the almonds with the oil in a medium bowl until they are well coated. 5. Toss the almonds with the spice mixture. 6. 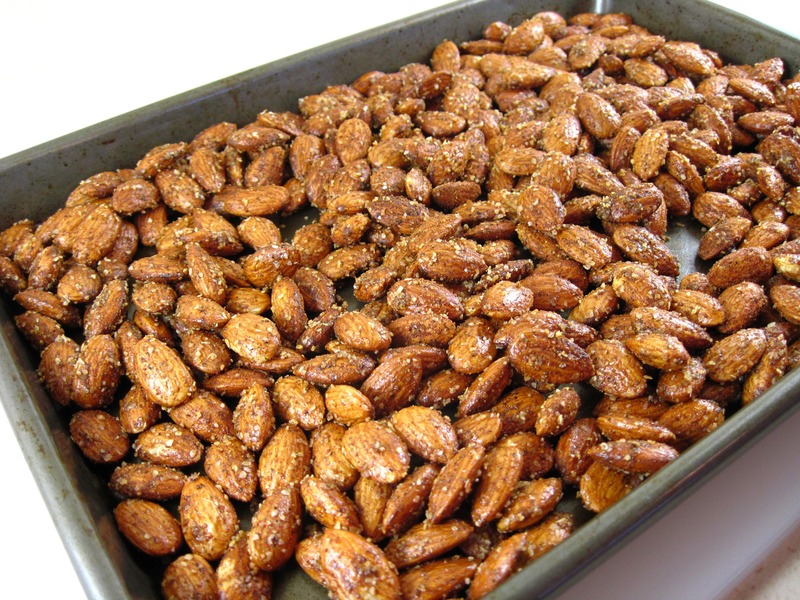 Spread the almonds on a baking sheet and bake for 5 minutes (4 minutes for cashews). 7. Stir the nuts and bake an additional 5 minutes (another 4 minutes for cashews). 8. Watch the nuts carefully; you want them to get slightly darker, but you don’t want them to brown. 9. Cool the nuts for at least 45 minutes before eating. In addition to simply being delicious on its own, this will be a great appetizer for an Indian meal. Love your labels for bagged gifts! I want these for an afternoon snack! And you got me curious about mango powder. These sound yummy! I have not used mango powder, but it sounds like an interesting flavor! Oh, these look like great spiced nuts! And you offer such cute packaging! What a great snack. Very good for you too. I just bought several pounds of almonds. What perfect timing! 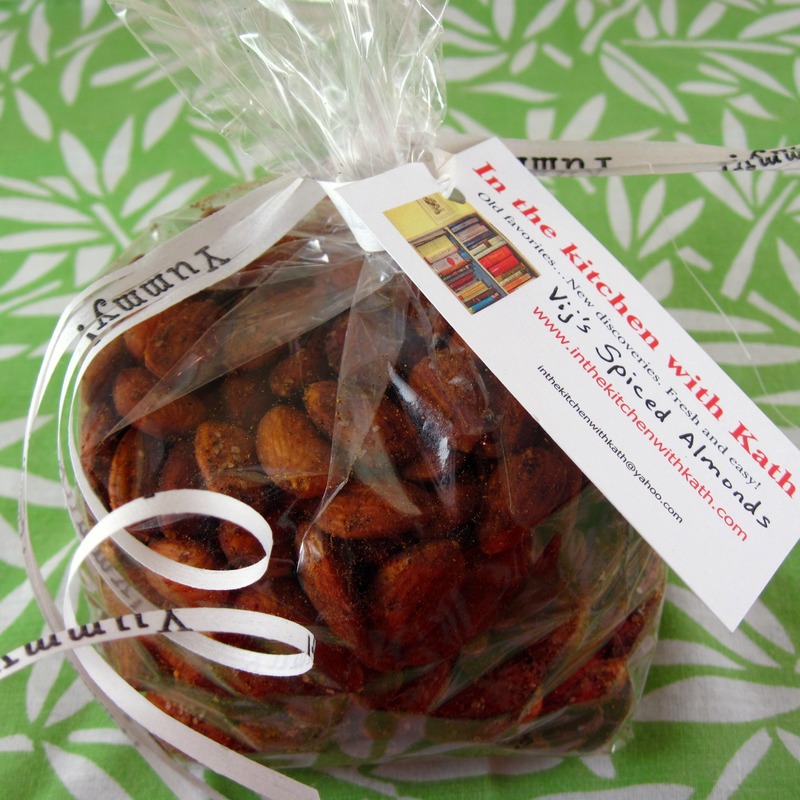 These would be great to snack on…and to give away as gifts! Thanks for sharing, sweet friend! What a perfect gift! Bookmarked! I’m a big fan of both almonds and cashews so I definitely gonna try this! Kath, these are such a great idea for a gift. I don’t know if I’ve seen mango powder around here, but I love having a new item to hunt for. Hope you are having a great week. Thank you for sharing our receipe with your followers. We have just reposted your blog entry on our Facebook pages, to support you back! 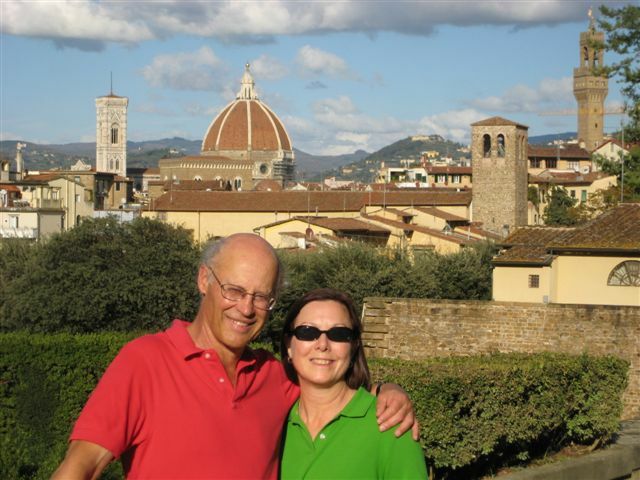 Thank you for this wonderful blog post and sharing this recipe with your followers. In support, we have reposted it on both of our facebook pages. Hope you enjoy more cooking with our cookbooks in the future. You know, I always see flavored and roasted almonds but I never think to make them like this! And aren’t you creative with your packaging! You gave me an idea!!! I hope you are having a most excellent day, my dear.